New York: This is the last in a series of posts that came out of my visit to the Islamic Art collection at the Metropolitan Museum of Art in New York and a consequent conversation with Dr. Maryam Ekhtiar, an Associate Curator in the Department of Islamic Art there. This art collection is presented in fifteen new galleries that opened to the public after an eight year renovation in November last year. 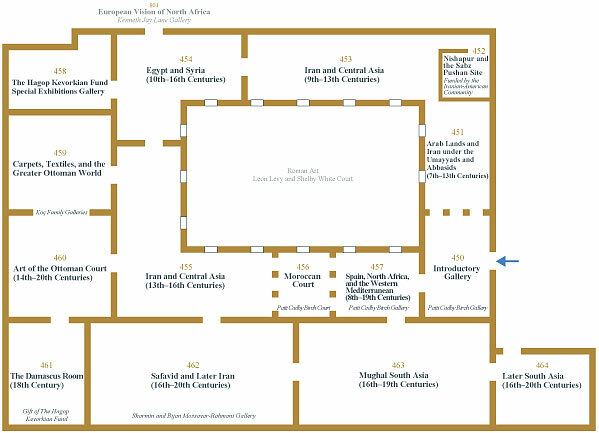 The galleries are titled Art of the Arab Lands, Turkey, Iran, Central Asia, and Later South Asia. Dr. Ekhtiar, in speaking of the nomenclature of the collections, said, “the name of the galleries speaks to the parameters of our collection, our department’s collection”. Instead of the overarching phrase “Islamic Art” that suggests a monolithic construction of an Islamic culture; this title is in fact a clue to the physical and historical reconfiguration of these galleries, and a particularly apt one in these times of misleading narratives of Islam worldwide. Through the course of my conversation with Dr. Ekhtiar we walked chronologically through the numbered galleries (Galleries 450 – 464) that are organized by geographical regions and time periods (from ca. 7th century AD through ca. 20th century). I have followed the same chronology here, bringing us today to the last two galleries 463 and 464 showing Mughal and later South Asian art. We haven’t discussed South Asia previously but the time period (16th – 20th centuries) that we will look at today is contemporary to the arts of Safavids and later Iran and the overlap and exchange of culture is visible in the artistic forms of the time as well. Gallery 463, for example, presents the arts of the Sultanate, Mughal and Deccan courts from about 1450 through the nineteenth century. This gallery contains an extensive selection of jeweled arts that were practiced in South Asia, including jade carving (which was highly prized in China and was part of a commercial exchange with it). But like in Gallery 462, the two object forms that immediately capture attention are the carpets and the illustrated manuscripts’ folios. The scrolling vegetal designs that we saw in last week’s post are visible in the image on the left as well. 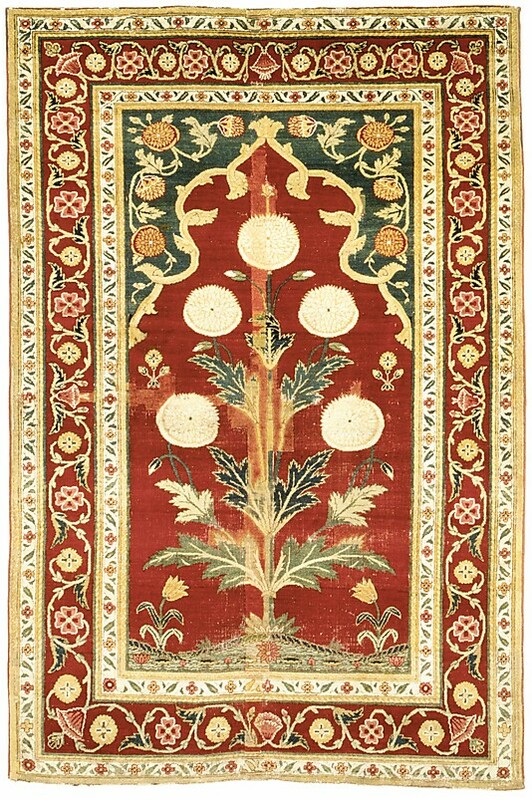 The carpet below, on the other hand, with a niche that nestles a flowering plant, appears to be designed vertically and possibly for hanging on the wall rather than laying on the ground. Interestingly, these styles remained active in the Iranian and South Asian regions. 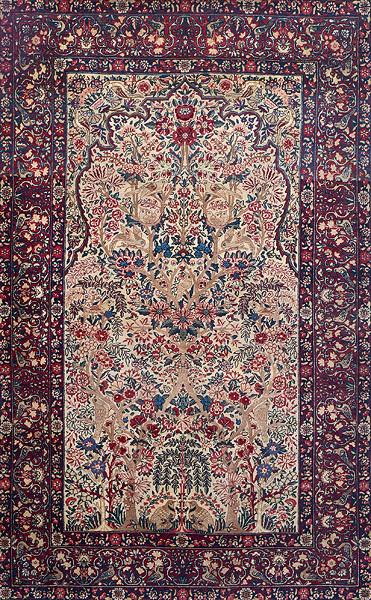 The early 20th century example below, from a Saffronart auction in March this year displays a combination of these design details – the visible Arabesque niche in the carpet is occupied by intricate and delicate flora and fauna, surrounded by a border. 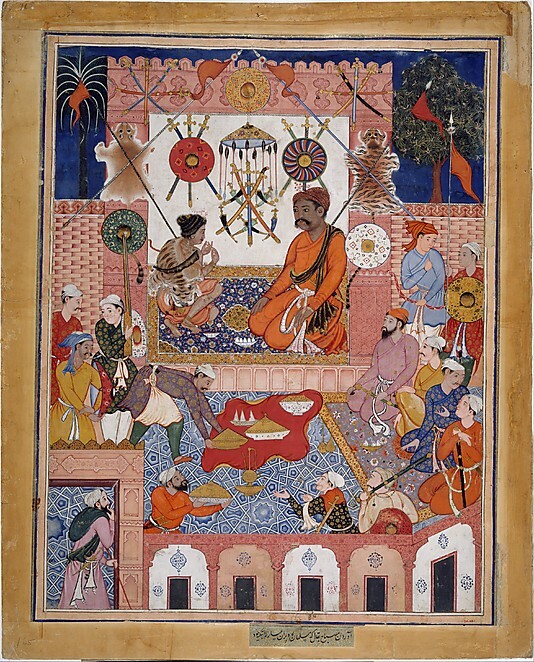 Illustrated manuscripts, similarly, remained an active part of the region through the 20th century as indicated by the folios on display in this gallery and in Gallery 464. 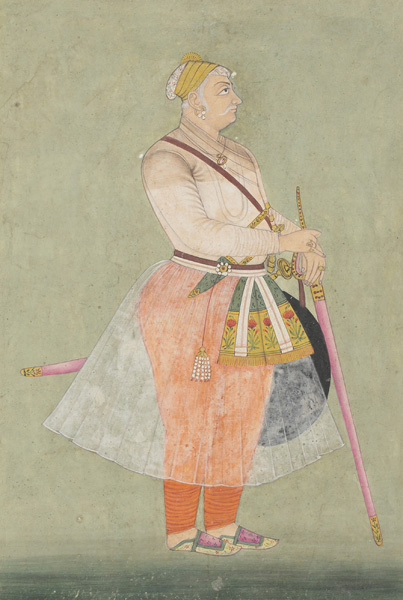 Akbar, considered the greatest Mughal rulers (r. 1556 – 1605), established royal ateliers and commissioned illustrated manuscripts, including the Akbarnama that was a chronicle of his reign. 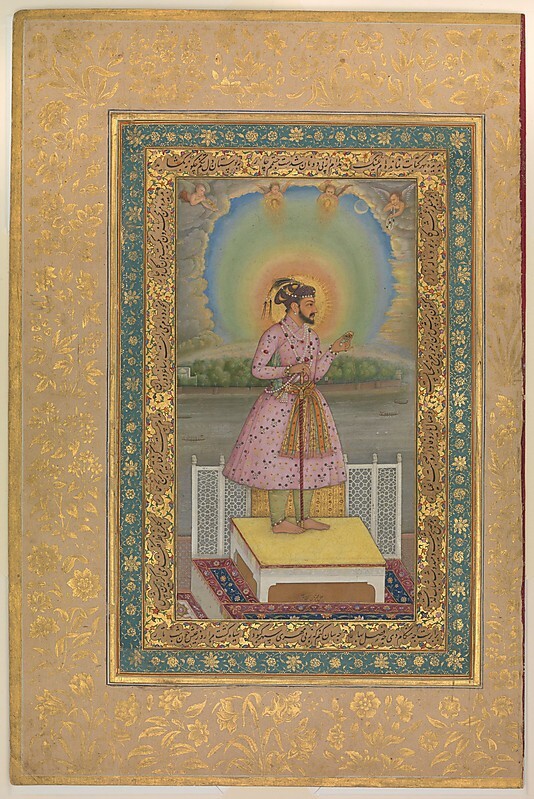 His successors Jahangir (r. 1605-27) and Shah Jahan (r. 1628-58) continued this patronage,an example of which is the exquisite Padshahnama, or the Shah Jahan Album illustrated through the 1640s. These reigns saw a diversity of manuscript production that included Indian, Persian and European elements (like linear perspective and European motifs). A few of the folios shown below evidence this multitude of subjects like studies of animals, flora and fauna, portraiture,mythological narratives that were produced simultaneously at that time. 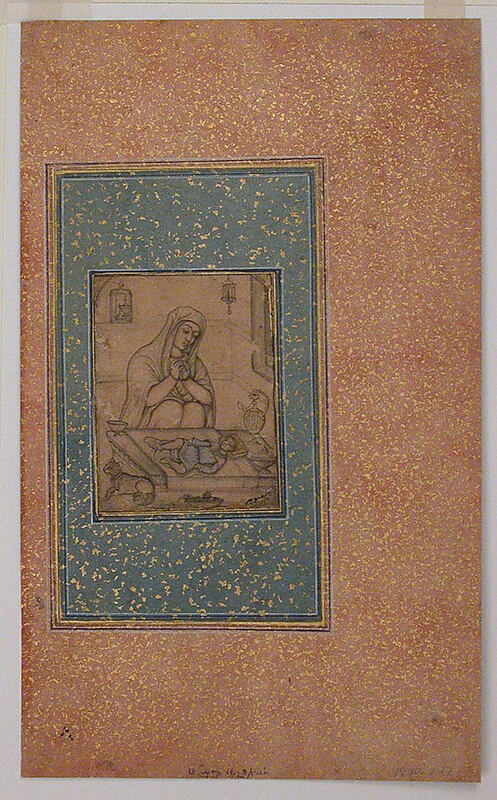 It also underlines the development of a unique idiom within the South Asian region in the arts of the book both linking it to and distinguishing it from the Safavid and later Iran workshops. 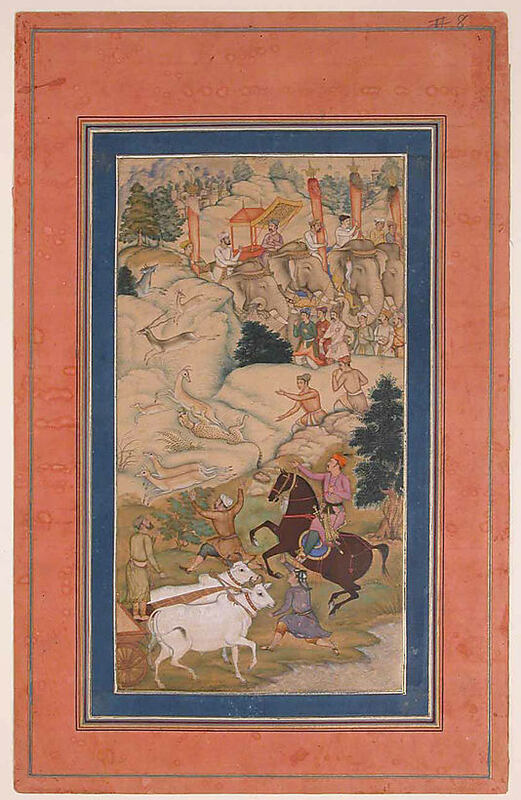 Adventures of Hamza or the Hamzanama was another narrative commissioned by Akbar that recounted the stories of Hamza, an uncle of Prophet Mohammad. 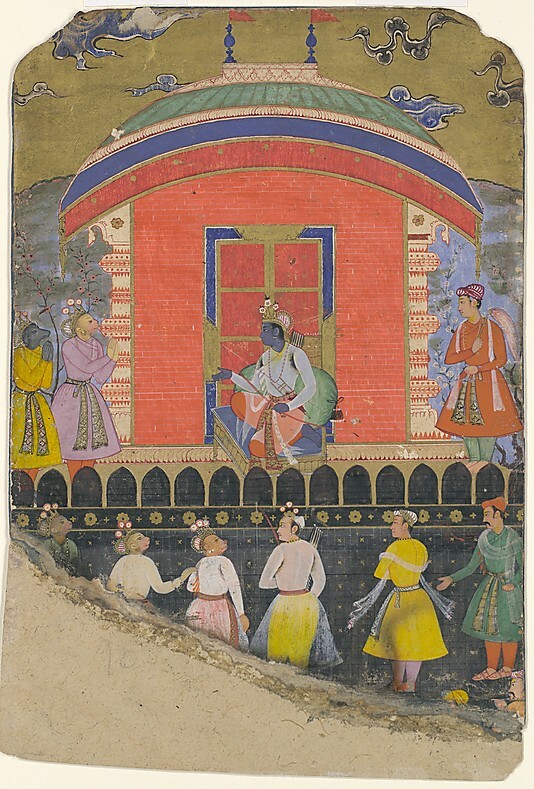 Both Galleries 463 and 464 also have folios from the Islamic Deccan courts and later 19th century court arts of the Jain, Rajput, Pahari and “Company” style paintings. These are placed in conjunction with the Islamic art galleries to accurately represent the continuum of South Asian art, not compartmentalized by religion. There was a rich dialog between the two contemporaneous traditions that is visible throughout these galleries. 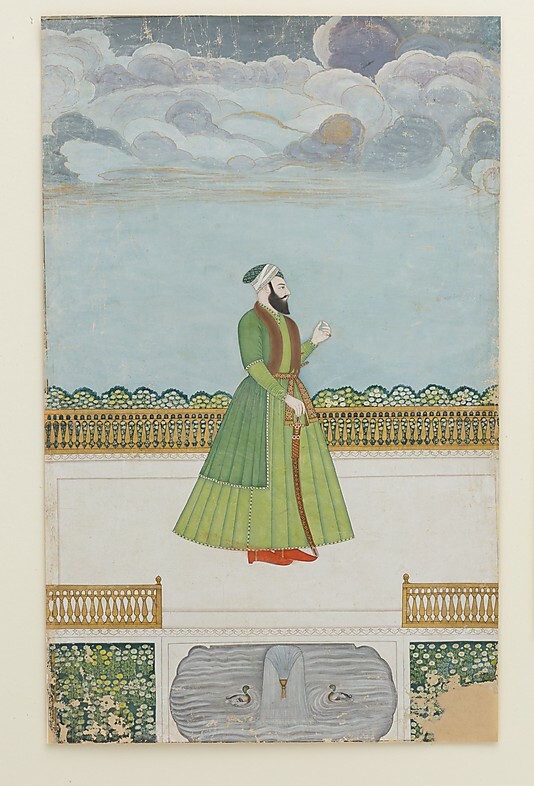 For example, the image below on the left, of a nobleman on a terrace is an 18th century folio from a late Islamic Mughal center in Bengal, and on display in these galleries. The image on the right, from a Saffronart auction in April this year is the portrait of a Hindu Bikaneri maharaja. Such cross currents in portraiture, amongst other subjects, is a constant in these artistic traditions. Ragamala paintings, also available for viewing, are a pictorial narrative mode for musical notes (ragas) that originated in the Islamic Deccan kingdoms but found their way to the ateliers of princely states in Rajasthan. And finally, the “Company” school paintings, shown in Gallery 464 often documented the flora, fauna, topography and people of the land. 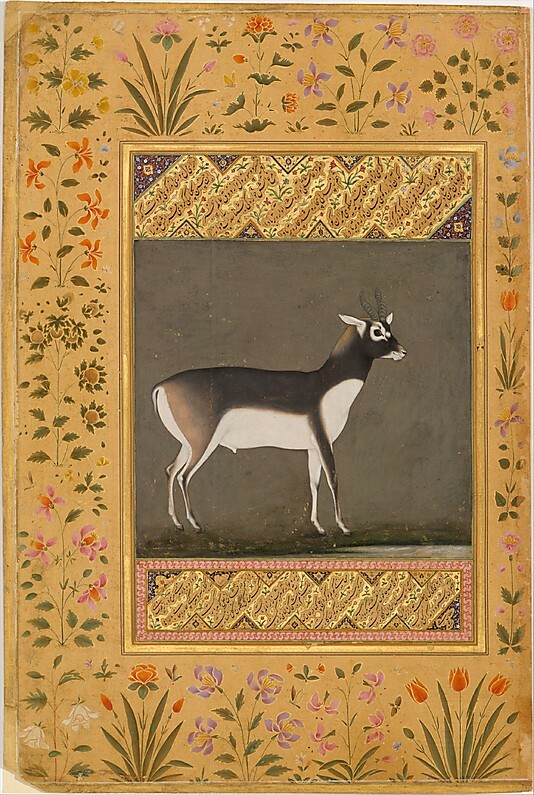 These watercolors were commissioned by the British and executed by Indian painters in a European style. Chronologically the last space in the newly configured galleries that we have been visiting over the last few posts, Gallery 464 can also be physically entered and understood independent of the remaining galleries.However, that is true of any of the fifteen galleries. Choosing your personal path through these spaces engenders a distinct experience each time. Text (calligraphy), shapes (geometric, vegetal, figural, flora, fauna, zoomorphic), materials (ceramic, wood, metals, paper, textile), techniques (luster-painted, gilded, enameled, painted, carved), objects (utilitarian, luxurious, decorative, religious) – these are just a few of the forms that can be conceptually and visually followed through these galleries. Recurring, in various ways, in various objects, they tell a story of a cultural continuum, not an overarching structure – this is a testament to the impeccably curated experience of these new galleries. I hope you’ve enjoyed this ride with me. The Saffronart blog hopes to keep taking you along for more of these! Thank you for each of your work on this site. My niece enjoys carrying out investigation and it is easy to understand why. Many of us notice all of the lively method you convey great solutions via the web site and as well as attract participation from some others on this issue plus my child is in fact being taught a whole lot. Have fun with the rest of the new year. You’re the one doing a really great job.